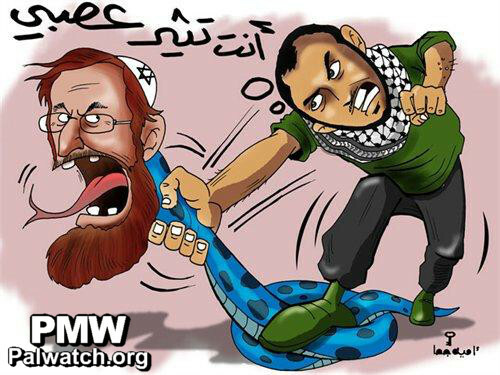 Palestinian Authority approved cartoon, inciting Palestinians to run down Jews. Six Israelis murdered by terrorism in the past month compared to five in the past two years, 100 Israelis have been wounded by wave of terrorism in past month. This page is not a complete record of every terrorist outrage; merely a representative sample to make the point. This is not just a random or spontaneous outbreak of murderous rage. Mahmoud Abbas, Palestinian Authority leader, is busily inciting a new Intifada at every opportunity and is backing it up by praising the murderers that have been killed by security forces as glorious martyrs. Earlier, Mahmoud Abbas made an impassioned speech demanding that Palestinians stop "Jewish settlers" from entering the Temple Mount and otherwise confront the "fierce onslaught on Al-Aksa Mosque, Jerusalem and the Holy Sepulchre Church." He called Jerusalem the eternal capital of the Palestinian state and said without it there will be no state. Israel's ambassador to the United Nations Ron Prosor issued a scathing critique (November 2014) of the UN Security Council's silence following multiple terror attacks against Israelis in the past three weeks. "Every day Israelis are coming under attack. Every day the crowds of violent Palestinian rioters grow larger," he said. "And yet, this institution has not uttered a word to denounce attacks against Israelis. Ignoring incitement and terrorism is similar to supporting terrorism." Two more Israelis were murdered today, a young male soldier in Tel Aviv and a young woman in Alon Shvut, in the outbreak of Arab terrorism that has erupted within Israel and the disputed territories. This terror is taking the form of random attacks by stabbings, ramming into people waiting at train stops, rock-throwing and rioting. Israelis on Tuesday mourned the deaths of 26 year old Dalia Lamkus of Tekoa and IDF Sgt. Almog Shiloni, 20, from Modi'in, who were both killed in knife attacks by Palestinian terrorists on Monday. 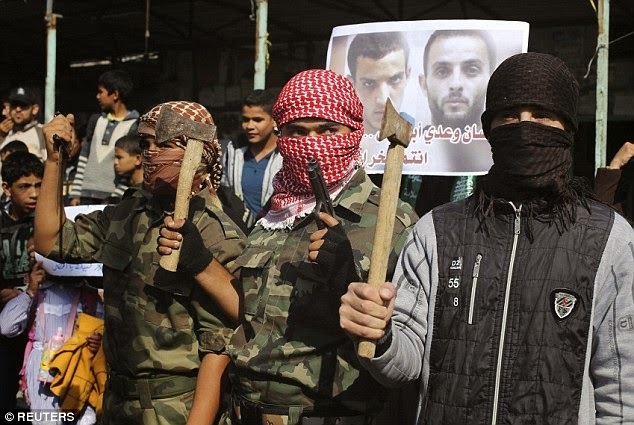 Islamic Jihad terror militia claimed responsibility for both attacks, which received warm praise from Hamas and other groups who declared the "Knife Intifada" had begun. A 32 year-old Israeli man was stabbed in the upper body with a screwdriver in Jerusalem. The attack took place on HaNeviim Street, in central Jerusalem, near the Damascus Gate. After the attack, the assailant, described as an "Arab youth" took off, disappearing as he raced towards the Nablus Gate of the Old City. Four worshippers were killed and eight others injured in a terrorist attack on a synagogue in the Har Nof neighbourhood in Jerusalem this morning. Two terrorists armed with guns and axes burst into the synagogue during morning prayers and began attacking the worshippers. The terrorists were killed in a firefight with police. Initial reports claimed that the two attackers were cousins, Jerusalem residents, and that one of them worked at a shop near to the synagogue. The attack is one of the worst terrorist attacks to take place in Israel in years. Prime Minister Benjamin Netantahu said, "This is a direct result of incitement led by Hamas and Abu Mazen [Mahmoud Abbas], incitement that the international community has been irresponsibly ignoring. US Secretary of State John Kerry, in London for meetings, condemned the attack saying, "This simply has no place in human behaviour. 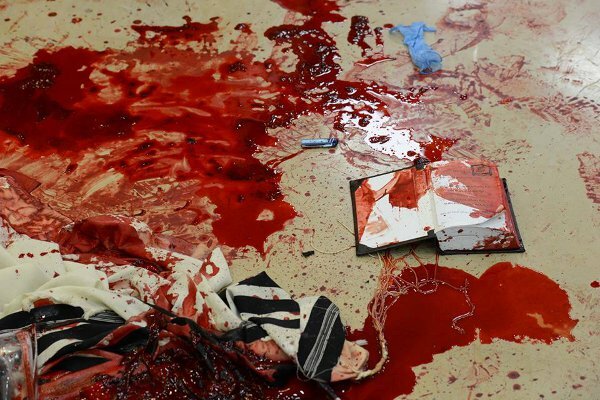 People who had come to worship God in the sanctuary of the synagogue were hatcheted and hacked and murdered in their holy place in an act of pure terror and senseless brutality." Hamas spokesman Sami Abu Zuhri said in a statement. "The operation in Jerusalem is a response to the murder of the martyr Yusuf Ramouni and to the series of crimes by the occupier at Al-Aqsa and Hamas calls to continue these operations," "Hamas calls for more operations like it," he added. Islamic Jihad echoed the comments in a separate statement. "Islamic Jihad salutes the operation in Jerusalem which is a natural response to the crimes of the occupier," it said. Hamas was referring to a bus driver from East Jerusalem who was found hanged inside his vehicle late on Sunday in an incident Israeli police described as suicide but which a colleague said looked like murder. An autopsy on bus driver Yousef al-Ramouni confirmed his death as a suicide and determined that it is not considered suspicious. The autopsy was carried out at Israel's Abu-Kabir medical centre. A Palestinian pathologist appointed by Mr al-Ramouni's family took part in the autopsy. While Mahmoud Abbas issued his fake "condemnation" of the slaughter of Jewish worshipers this morning, the political party he leads embraced the terror attack. The official Fatah website called this a "heroic operation" and its officials praised the attack. To justify why Abbas condemned this morning's murders, Fatah aired a video in which Arafat's bodyguard explained that Abbas' condemnation was just like those of Arafat, who was lying when he condemned terror attacks. Abbas' office: "The President's office condemns the murder of the worshippers"
Abbas' advisor about the murders: "heroic operation"
Abbas' Fatah "welcomes the operation" and "escorts the Martyrs to Paradise"
Fatah was Handing out candy in the cities of the West Bank in celebration of the Jerusalem operation"
In an unprecedented gesture of hostility towards Israel, the Jordanian Parliament on Wednesday opened a cabinet meeting with a moment of silence for the two Palestinian terrorists who slaughtered five Israelis in a Jerusalem synagogue a day earlier, Israel’s NRG News reported. "The members of the Security Council expressed their condolences to the families of all those who have died and sympathy to those injured and to the Israeli people." The statement also urged all sides to work immediately to restore calm as tensions rise between Israelis and Palestinians. Words are cheap - will it change their position towards Israel? The second sentence above suggests a hasty attempt to establish moral equivalence instead of tackling Palestinian incitement! How did the Media cover the event ? Plus CNN gaffe "Deadly attack on Jerusalem Mosque"
One BBC news item commented about the killings "in a time of heightened tension over the Temple Mount" No realisation that this is the fruit of a new intifada that Mahmoud Abbas is stoking for all he is worth, while saying that Netanyahu is not serious about peace. Meanwhile, Abbas is seeking unilateral statehood without peace talks!! In a joint operation, Israel's Security Agency (Shin Bet) and the Israel Defence Force (IDF) took down a Hamas terror cell planning a number of large-scale attacks, including one on Jerusalem's Teddy Stadium. Over 30 suspects were arrested and explosives, M-16s and ammunition were confiscated. The terrorists had been taking their orders from Hamas' Turkish headquarters, guided by Saleh al-Arouri, the man also responsible for the June kidnapping of three Israeli teens, according to Israel National News. Al-Arouri was also behind another major terrorist cell in Judea and Samaria, broken up in August. The men were recruited, beginning in 2012, from a number of foreign states, such as Jordan and Kuwait, as well as from within the Palestinian Authority. The cell was based in Judea and Samaria, but the terrorists were also trained abroad, in Turkey, Syria and Jordan. They were smuggled in and out of Gaza via terror tunnels, and relocated to the West Bank this year. O son of Jerusalem, cry 'Allah is great'!" Palestinian Authority President Mahmoud Abbas warned that the Palestinians will not allow Israeli extremists to "contaminate" the Temple Mount, and said that allowing Jewish prayer at the site would risk a global religious war. The PA leader also maintained that the rioters at the Al-Aqsa Mosque on the disputed holy site had the right to defend themselves, and said Muslims and Christians would never recognize Jerusalem as the capital of Israel. Abbas's remarks (Arabic link) came in an address to thousands who gathered in Ramallah in honour of the 10th anniversary of the death of PLO leader Yasser Arafat, during which he cautioned the Israeli government against changing the status quo at the Temple Mount. Palestinian Authority President Mahmoud Abbas said that he intends to move the shrine for late Palestinian leader Yasser Arafat to Jerusalem, the Bethlehem-based Ma'an News Agency reported Sunday. Speaking during a memorial marking 10 years since Arafat's death in Ramallah, Abbas said Arafat should "remain immortal in the hearts of our people." 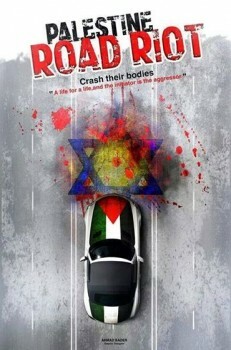 Palestinian hate song: "Run over the baby"
Anas Garadat and Abu Khayad, a duo of Palestinian singers are provoking Israelis during this tense time by releasing a song in the social media that encourages hit and run terror attacks. "Run over the two month old baby", they sing. "For Al-Aqsa we will run over settlers"
"For Al-Aqsa we will run over settlers. Run over settlers. Make the road become a trap, Allah will help you. 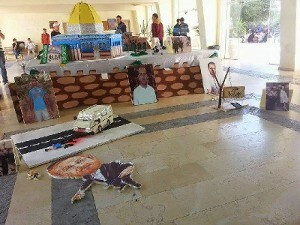 The whole Arab nation calls you - bless you Akari Ibrahim*, run over run over!" Palestinian online users and in the Arab world in general saw the song on Youtube and Facebook and it received many shares and likes and the performers were encouraged by the users to continue. 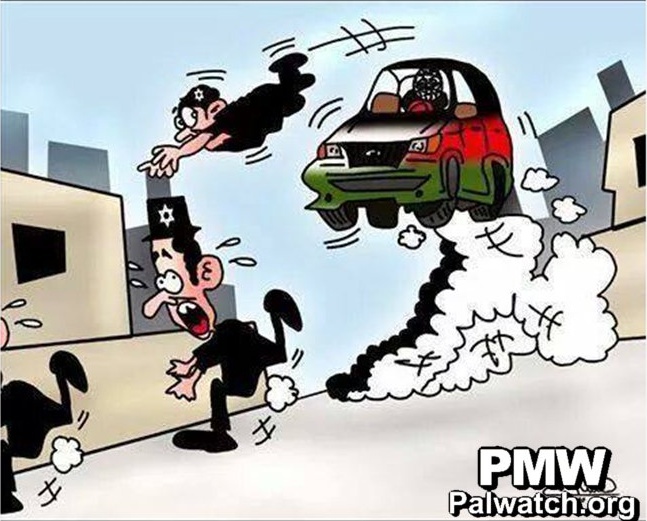 In wake of wave of brutal vehicular terror attacks against Israelis, the Palestinians distribute cartoons depicting cars to Hamas rockets on the social networks. After two vehicular terror attacks occurred on Wednesday, wounding 16 people and killing one, Palestinians have termed their latest resistance efforts a "car intifada" and are posting cartoons online likening vehicles to rockets launched by Hamas during Operation Protective Edge. Following the wave of attacks in which drivers ploughed their cars into groups of people, which started two weeks ago with the attack that took place at the Ammunition Hill light-rail stop, killing 3-month-old Haya Ziesl Baron and Ecuadorian Karen Mosquera (22) - Palestinians came to understand that vehicles could potentially be used as lethal weapons. Hamas, whose officials praised the terror attack in Jerusalem, is fueling the fire and is attempting - through vehicular attacks - to initiate an intifada. Israeli Authorities intercepted a massive shipment of tens of thousands of firecrackers, as well as knives, Tasers and other weapons Thursday that police say was en route to rioters in East Jerusalem. Intelligence information led police and customs officials to the shipping container in Afula, which had been marked as containing Christmas lights, police said. The container contained some 18,000 firecrackers, 5,200 knives, 4,300 Taser-flashlight devices, 5,000 electric shock devices and 1,000 swords, according to a police statement. Police said it was the largest seizure of weapons of the type in recent history. According to police, the enormous stockpile of weapons was intended to supply Palestinians in East Jerusalem, who have thrown firecrackers, Molotov cocktails and stones in ongoing clashes with police amid rising tensions in the capital. The containers, shipped from China to the Ashdod Port, were addressed to residents of the East Jerusalem neighbourhood of Beit Hanina. The containers were picked up by three Israeli Arabs from the north who came to Ashdod to collect the shipment with two trucks. The three suspects were unloading the shipment into a warehouse in Afula where they were arrested together with their drivers and the warehouse owner. Palestinians threw three Molotov cocktails at buildings in a Jewish neighborhood on the Mount of Olives Thursday night. Light damage was caused, and no one was injured in the attack on the East Jerusalem Ma'ale Hazeitim neighbourhood, Israel Radio reported. PA and Fatah: Israel killed Ziad Abu Ein "intentionally" and "in cold blood"
Abbas: "A savage attack... a barbaric act that cannot be passed over in silence or accepted"
A British television news reporter has revealed that Palestinian demonstrators near the West Bank village of Turmusaya prevented an Israeli medic from providing aid to a Palestinian Authority official who collapsed after he shoved and verbally abused Israeli officers on the scene. Palestinians blocked an Israeli medic from assisting PA official Ziad Abu Ein after he furiously confronted Israeli officers. In a live report for the UK’s Sky News broadcaster, Middle East correspondent Tom Rayner reported that Ziad Abu Ein was lying on the ground “unconscious” after the clash – although separate footage shot by Kremlin broadcaster RT displayed Abu Ein conscious and sitting up after his altercation with the IDF officers. Roi Sharon of Israel’s Channel 1o broadcaster, said that Abu Ein collapsed some five minutes after his confrontation with the Israeli Border Police. A top member of the Fatah leadership said that the autopsy of a senior Palestinian official showed he died after being struck and inhaling tear gas during a clash with Israeli forces a day earlier. An official Israeli Health Ministry statement disputed the claim, however, and said Ziad Abu Ein died from a heart attack brought on by stress during the confrontation. the autopsy showed Abu Ein had a pre-existing heart condition and may have died after suffering pressure to his neck during the scuffle with the soldiers. There was also evidence of an attempted resuscitation, the ministry said. Israel gets condemned by foes and friends alike due to the widely held belief that punitive house demolitions do not dissuade would-be terrorists. The study, “Counter-Suicide-Terrorism: Evidence from House Demolitions,” to be published in the January issue of the Journal of Politics, found that Israel’s policy of demolishing the homes of Palestinian terrorists causes “an immediate, significant decrease in the number of suicide attacks.” Co-authored by researchers at Northwestern University and the Hebrew University of Jerusalem. In November 2014, Israel resumed its controversial policy of demolishing the homes of terrorists when it razed the family home of Abdelrahman Al-Shaludi, who ploughed his car into a Jerusalem bus stop in October killing a young woman and a three-month-old baby. Police shot him dead at the scene. Since that time, Israel has destroyed the family homes of several other Palestinian terrorists.